Do you remember the great calculator debate? My trigonometry was learned with little books of Sine, Cosine and Tangent tables. It might have been the last century but it wasn’t that long ago. Did manual mental maths make me a better learner? No. It just used different parts of my brain. Progress through O and A levels was influenced by wider factors. My initial education was as socially divided and culturally defined as it is for millions of children today. One difference is the degree to which technology is now used for teaching and learning. …there wasn’t much good news. VLE are being used for governance and performance management with active surveillance being presented as helpful and benevolent. The panoptican of analytics fits well with Foucauldian views of discipline and self-regulation. It’s not difficult to see how monitoring student clicks reveals less about their learning ‘experience’ and more about strategic approaches to assessment. I liked the expression the ‘silences of VLE’ or what is not known because it can’t be seen or monitored – mainly the human aspects of education which technology has been been good at replicating 🙁 Another risk of analytics is highlighting norms and privileging them, which in turn reinforces the power of the designer to replicate majority expectations of behavior. VLE mostly replicate existing pedagogies rather than challenging or reinventing them. A reliance on transmission models privileges content production. Once resources are in place their delivery can be seen as something anyone can do which might raise questions about the need for qualified teachers in the first place. VLE also raise issues of status, not only lack of it for teaching online but the liminal nature of virtual environments and identities. Many times on TELEDA and in the research interviews, colleagues have said it was challenging to conceive the person behind the digital name. Nearly all described how the virtual was less privileged and easier to neglect during busy times. In terms of working with others, group members (and myself) were perceived as Un-Real or Other. Despite all best efforts, the virtual teaching space remained an artificial one. Lack of status is further reinforced by the absence of an agreed name for e-teachers. Tutors, trainers, faciliators, moderators, instructors but never e-lecturer. One inevitable conclusion is maybe ET doesn’t have all the answers after all and early promises of transformation through VLE were lies! Later in the book Selwyn cites Braverman* on deskilling, Machines were introduced into factories under the guise of being improvements for workers when the reality was loss of human labour. Braverman sits within a specifically Marxist approach and there is a problem with politics which fall into the trap of critique from a corner. For me, challenging ideology is best achieved through working alongside existing structures rather than in opposition to them. Investing academic effort into highlighting problems without offering practical solutions is not helpful. Aside from this, Selwyn is always worth reading. He reminds you technology is never neutral but represents value laden sites of unequal power relationships. We’ve all been seduced into accepting technological progress as unquestioningly positive. So much so, even voices suggesting elearning has failed can only offer solutions within the paradigm promoting belief in the magic if we could just find the answer – like application of more rigorous theoretical approaches to content design and delivery*. Selwyn says those working with ET genuinely believe in its affordances. They are unable to see the underlying politics disguised as promises to cut costs, increase efficiency and choice, support diversity of access and produce self-directed learners. ET’s ideological foundations have to be revealed through critical thinking and reflection before we can see its shaping by dominant interests which seek perpetuation. What’s the solution? Selwyn calls for bottom up approaches towards ET, giving voice to the marginalised and silenced, including those who teach and support learning. While technologists and managers make key ET decisions, the experience of day-to-day users often gets missed. TELEDA tries to bridge some of these divides by creating space for critical reflection but, understandably, most colleagues are focused on how to use ET to enhance the teaching of their subject and their students’ experience. While this is no reason to abandon the soapbox on digital exclusion and broader thinking around the adoption of ET, distrusting it seems likely to remain a minority occupation. Braverman, H. (1974) Labor and Monopoly Capital: The Degradation of Work in the Twentieth Century. New York: Monthly Review Press. Reeves, T. C., McKenny, S. and Herrington, J. (2010) Publishing and perishing: The critical importance of educational design research. Proceedings ASCILITE Sydney 2010. There are two sides to every story, sometimes three, four or more. Experience influences interpretation and a university should contain oppositional views. Negotiation is the name of the game and there is nothing like educational technology to polarise views. As the new academic year brings discussions around implementing a digital education strategy, I feel a growing sense of unease. The VLE is mostly a repository of attachments to module guides, lecture notes and powerpoint presentations; it has become an information conduit not a communication facilitator. Adoption remains patchy. Early promises of transformation have not been fulfilled. Rather than blue sky thinking around what might be possible maybe we should begin with what we know. Using technology can take more time than it saves, it’s likely to break down, disconnect, not be there when needed, involve steep learning curves, operate through an ever diminishing set of access criteria and is ultimately a poor substitute for human face to face interaction. I continue to support teaching and learning online. I believe it enhances distant and blended learning and 24/7 mobile access to relevant content and procedures can only be an advantage to busy people living busy lives. So why the distance between the users and non users, the early and late adopters? Rather than prioritise innovation, should we pay attention to resistance? Not everyone is comfortable interacting with a machine. One reason is time. Promises of efficiency are diluted by the reality. Managing teaching and learning online requires significant amounts of time to adapt content, facilitate collaboration and group work, moderate communication, and respond to students on individual basis by text or video. Technology is not always efficient. It breaks down. It confuses. Why cant I find anything on the portal? In a recent editorial for Learning, Media and Technology, Neil Selwyn* asks how technologies which arrived on promises of a ‘freer and fairer education’ have had the opposite effect. What happened to ‘…pre-millennial expectations of the cyber-campus and seamlessly ‘blended’ learning?’ Where are instances of digital technology which are ‘…genuinely enabling and empowering for those that use them?’ Promises of transformation go on; mobile learning – flipped classrooms – more open educational resources and courses. The voice of the academics are seldom heard. Digital divides by their nature silence those who are late adopters or lag behind. Unless we listen to staff who are teaching and supporting learning – rather than being driven by interests outside of the lecture theatre/seminar room – we’re not going to achieve bottom up sustainable change. I still believe in the affordances of virtual learning environments to widen participation and offer genuinely authentic learning experiences. I still believe ICT can disrupt and democratise – but the essential workloads need to be acknowledged and shared. 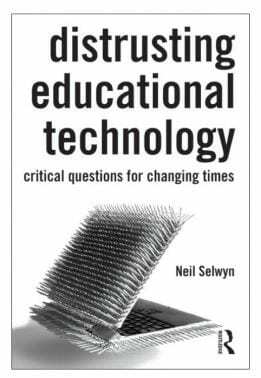 I agree with Selwyn who suggests digital technology for university educators should be developed by the same university educators. Greater resources for courses and those who teach on them has to be worth revisiting as digital futures for teaching and learning are planned. Prensky’s polarisation of students and teachers into digital natives and immigrants was simplistic, but the KIS (Keep It Simple) approach can be an effective stimulant for debate. Prensky has been responsible for a lot of debate. Dig underneath the surface and the core of Prensky’s polemic remains relevant. The question of how can the social shift to digital ways of working best enhance teaching and learning remains unanswered. Prensky was right. Those with Britannica feet are being replaced by generations whose only reference source is Google. 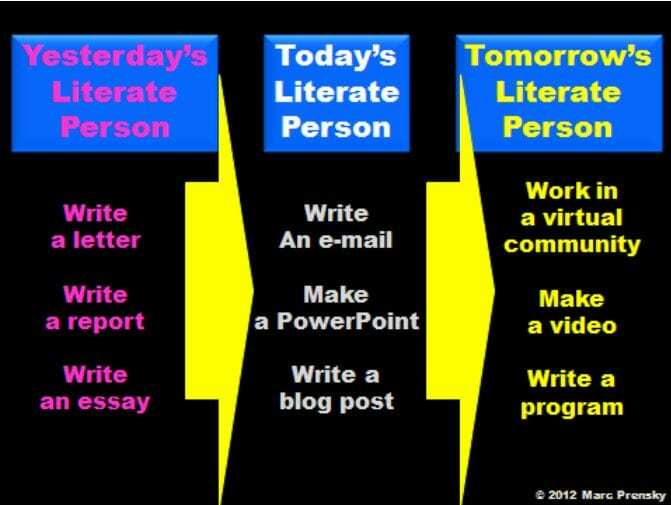 The image below is simplistic but contains a valuable message for anyone wanting to see digital literacies and scholarship embedded into the curriculum. How can an institution manage change and adapt to the digital impact of technology? Neil Selwyn* offers a realistic appraisal of Prensky, usefully reminding us of the social shaping of technology and how usage mirrors existing social structures. The literature of digital divides should underpin all policy and strategic approaches. In the meantime digital technology is becoming more pervasive. Soon won’t need the T in ICT; it will be taken for granted. It’s ironic how the strata of digital engagement has ‘shallowness’ as the deepest and widest layer. The key problem is the solid curriculum. It seems unable to flex enough to incorporate essential requirements for the century, namely individuals who can tell the difference between knowledge, information and personal opinion – online. The skills to manage vertical searching and differentiate between authenticity and conspiracy theories are the core basics of digital literacies, alongside the presentation of self and parameters of access. However, embedding all these into the curriculum, and focusing on digital graduate attributes, is only part of the answer. It isn’t only about student education, it’s about teacher education too. In 2001 Prensky was saying ‘today’s students are no longer the people our educational system was designed to teach’ but a decade later no one is saying today’s education system is no longer training the teachers it needs for a digital age. Calling people natives or immigrants drew attention to digital technology for education, but as well as redesigning the curriculum for students, we need to revisit support and resources for the teachers who are implementing it, something Prensky, Selwyn and other contemporary commentators appear – so far – to have missed.